Have you woken up in the middle of night thinking how am I going to steer my team, give them the direction that they need but at the same time not constraint in what they want to build/deliver. I recently went through one of these night- I have joined an interesting project where we have very tight timescale to deliver a tech product to operational staff. When, I say tight we are talking about the end product had to be delivered within 100 days. We had recently finished the discovery stage of the project, this had been very frantic and time pressured led- we only had three weeks to do our discovery. This naturally resulted in the team not having the opportunity to speak and consolidate their findings with each other. As, the lead business analyst on the project, it was my role on the project to make sure that we had the best picture of what the current ‘As is’ situation was like on the ground. It is also my role to make sure that we have got access to the policy and legal requirements that we had to work within. It was when we were heading rapidly towards the end of Discovery that I came to the realization that we had access to lots of information and ideas within the team. We needed some place where we could come together to discuss our findings and learning with each other. 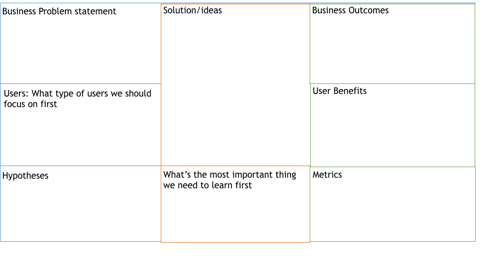 I learnt about Lean UX Canvas from this Jeff Gothelf blog that I happened to stumble across. I have always been a big fan of Jeff Gothelf especially his book ‘Sense and Respond’, so naturally I was curious about this canvas. For me this was a perfect tool, as it allowed everyone to contribute their findings into this one artefact, that we as the team could reference back to. Once, I decided I was going with this tool, I introduced it to the team, whom seemed to be onboard with trying it out. The best way to complete the canvas for me was to get the team together in the collaboration space and start having the conversation around the different components within the canvas. We decided the core area we needed to agree first was ‘what was the business problem that we are trying to solve’. Once, we agreed then we could then tackle what ‘Solution ideas’ that our products need to have. I must admit this is one that caused us the most discussion in the team- as the user researcher thought the solution should cover certain things while the service manager was not necessarily in agreement. However, by having these discussions we were able to expose areas that we still needed information on, or where we had gaps in knowledge in the team. We then, went around the canvas completing the different blocks within it. It took the team about a day to complete the canvas — which I think is ideal time period to do something like this. I would definitely recommend utilizing this tool with your team, it is a great way to bring all the professions together to get them discuss their findings. It, is also a great tool to generate conversation around the product that you are developing as a team. My other tip for doing a Lean UX Canvas is that it does not have to be perfect, don’t spend time trying to make it look pretty- we completed ours on brown paper that we took a photo of. This tool is not about a prefect artefact but instead it’s about making sure that as the team you can all agree what is the problem you are trying to solve, the hypothesis that you want to test and the riskiest assumption that you want to test first. This entry was published on Oct 26, 2017 / Rohela Raouf. Posted in Enterprise Analysis (BABOK KA). Bookmark the Permalink or E-mail it to a friend.